Since the very beginning AEGEAN PERLITES SA was oriented towards the Code of Good Practices for a Viable Development, in order to be able to smoothly operate by respecting both the environment and its personnel. The company offers safe working conditions whereas it contributes at its best to the local society’s daily needs. The good practices for a viable development that have been supported by the company all these years regard all three main unities of the Code (Health and Safety, Environment, and Local Society). However, great importance has been granted to the environment protection domain and the values that the company has adopted in order to concord a rational industrial development with the preservation of the local ecosystem. Every production process was designed and applied by always taking into consideration the natural environment’s protection and its viable conservation, in order not to disrupt the fine balance connecting man and nature. In order to implement the values we represent, we have created the most appropriate working conditions, with respect to the Code’s principles of Good Practices for a Viable Development and the region’s frontier individuality. As regards to personnel habitation, we have ensured the best possible living conditions by offering free daily meals prepared from specialized staff. Additionally we make sure that all Safety Rules are respected at all times and in this direction we organize regularly personnel safety drills along with continuous briefing on Health and Safety matters. Thus, we have achieved a zero rate accident account since the beginning, in the operational environment sphere. In a smooth operation context and in a constant seek for working conditions improvement; AEGEAN PERLITES SA has been awarded since 2006 the ISO 9001:2000 certificate. This confirms the significance that the company shows to the working conditions continual improvement. The space reserved for the deposit and natural drying of perlite products was created by excavation in perlite rock instead of being built as a conventional structure, so that it blends harmonically into the natural environment. 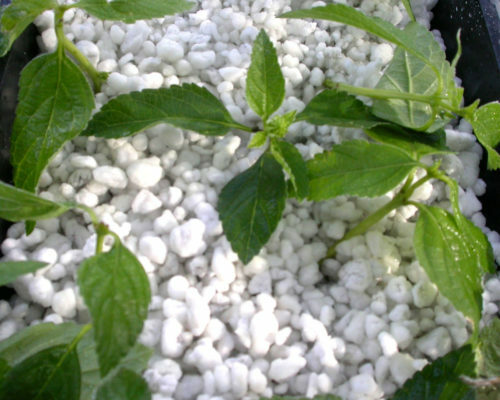 Additionally, thanks to the polycarbonic facings with which the whole roof is covered, perlite is dried in a natural way by the greenhouse effect. Thanks to the unique drying process described above, AEGEAN PERLITES SA contributes significantly in air pollution reduction forasmuch as in a different case we would have to employ other means for the drying process which emit high levels of carbon monoxide and are in general very aggravating for the environment. Moreover, owing to the previously described particular production process, we also accomplish significant savings in energy. In order to improve personnel working conditions but also to wipe out any possible impact on natural environment, AEGEAN PERLITES SA has activated from the very beginning, the road soaking process. By putting this method in application we have achieved a major reduction in respirable dust which is, in a different case, created by machinery and truck transfers. The perlite crushing and screening phase was methodized and it’s being carried out using the ore’s natural moisture exclusively. This method doesn’t create any dust or waste which can have devastating effects on the environment. Furthermore this technique improves considerably the personnel’s working conditions.